Starting within the audience as undercover waiters, audience members or security staff, The Slam Team offers a highly entertaining act. The troupe comprising of 5 talented percussionists creates an incredible spectacle of sight and sound as they present their dynamic and exciting sets of highly choreographed performance. 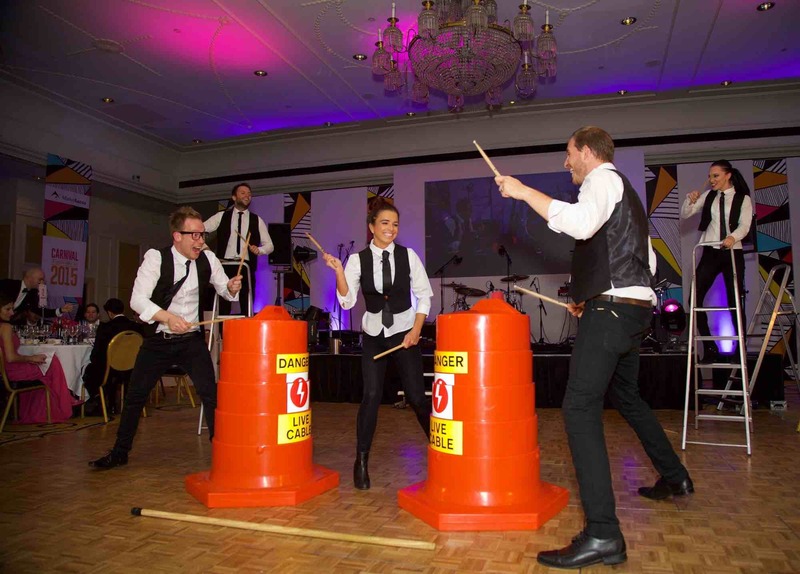 The drummers use all sorts of objects to fuse together driving arrangements played on ladders, traffic cones, cars, exhausts, wheels, windows and anything else they can get their hands on! The Slam Team have been touring their show for the last 5 years all over the world. 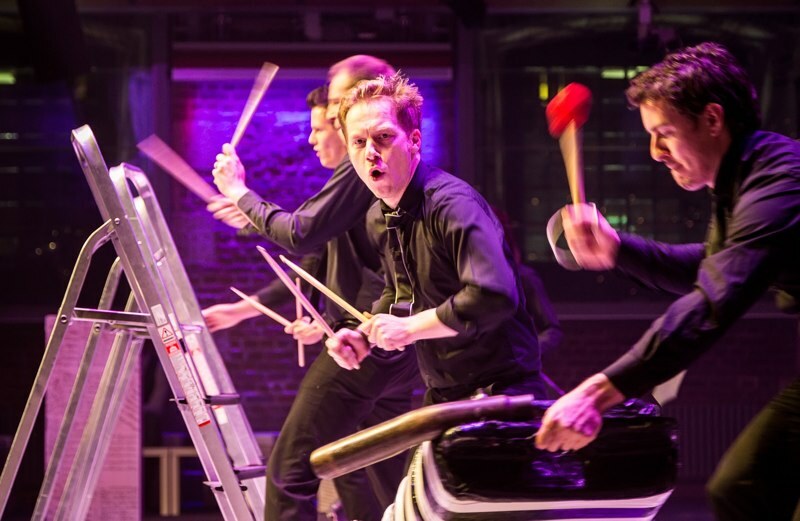 From motor shows in Korea to international conferences at Euro Disney, this hard-hitting percussion show is a top-notch act that will resonate in the minds of the guests long after the event. 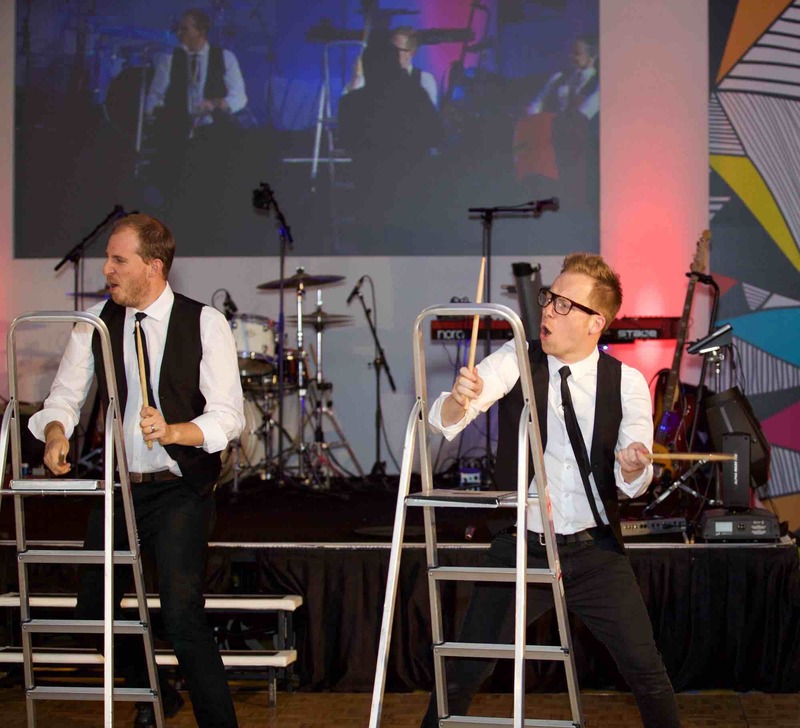 The guys have played for The Beastie Boys, Avril Lavigne, Eminem, Florence & The Machine, Cicada and Tony Hadley on numerous shows including T4, MTV, Top of the Pops, The Brits, Smash Hits Poll Winners Party, Channel 5 and ITV. Starting within the audience as staff, audience members or security, The Slam Team melts into the pre-show chitchat, serving or ensuring guest safety. The leading member of the team takes a well-timed fall and discovers the percussive possibilities of his spilled tray. Brushing aside offers of help from the audience the downed artist comes to life as a funky stylish drummer. From all four corners the security staff replies in percussive answers to the lead players’ call. And suddenly they turn the space into a vibrant, percussive experience. The cast of 5 bright performers and percussionists rock through 4 routines of ear-catching rhythm that will leave your guests gob-smacked. These routines are drum led and incorporate the striking of wood. Poles are used in 2 routines where they are played on the floor. The show will need a PA for the blisteringly funky backing track. Each performance lasts approximately 7 minutes. The band were excellent to work with, very easy going, friendly and made my job so much easier! I loved how they integrated with the audience and blended in. The way they started and shocked the audience was brilliant! Loved it! The Slam Team were the highlight of our awards evening in Valencia. 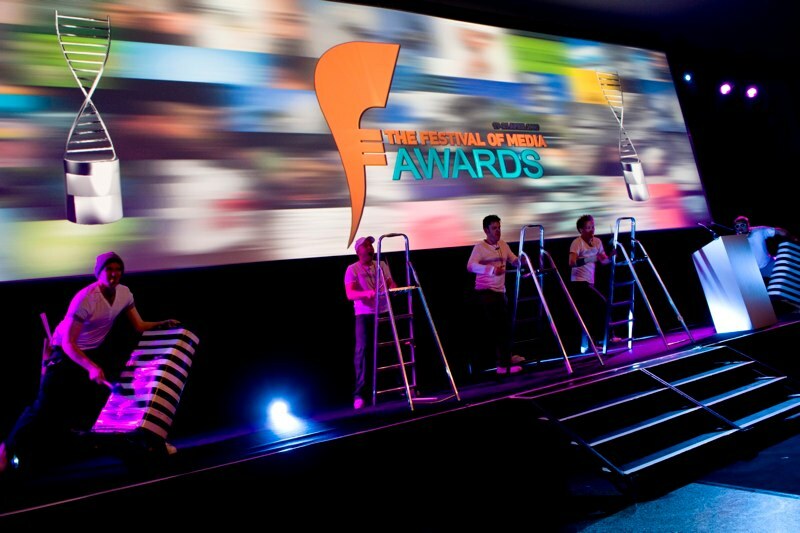 Their high impact performance stunned a usually cynical media crowd” – Valencia Festival of Media “This is the act that I want at every one of my events. 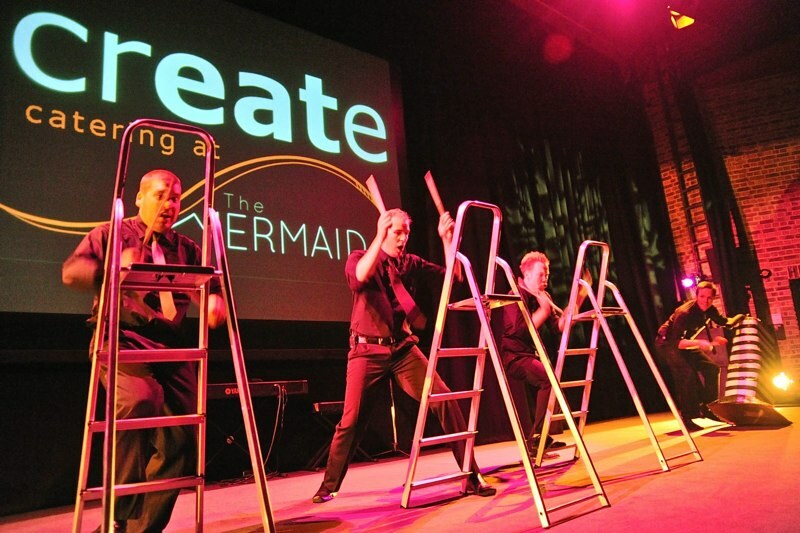 Launches, openings or just straight cabaret – these guys rock! The Slam Team rocked the Grosvenor with their exciting show. The boys were a joy to work with and changed their act to fit the theme with great ease. Thanks for your e-mail we were really happy with the performance, it was great, the audience really enjoyed it and it certainly had the wow factor we were looking for. The Slam team were a lovely group- very friendly and accommodating as well as professional. The Slam Team was amazing act both the client and the crowd liked them a lot. Please thank them a lot on behalf of Blink, the team was very very very cooperative. I thought the guys were really good, it was a good performance and the crowd seemed to enjoy it. Thanks for your help with this.